The Third generation STICK comes with a state of the art design and amazing features such as: 1024 DMX channels, touch sensitive panel, clock/calendar, remote control, Ethernet facilities, and much more…. This complete standalone, wall-mounted DMX color controller is the perfect answer to a wide variety of lighting control situations and has been designed to accept the most challenging projects with ease. The STICK-DE3 can be adapted to any lighting environment. You can dynamically control the lighting of a: house, bar, office block, shopping center, hotel or even a landmark. With 1024 DMX output channels and the ability to store 500 scenes across 10 zones, the DE3 is one of the best value controllers on the market today. The STICK-DE3 includes an Ethernet network connector allowing you to connect your STICK to a Local Area Network (LAN). Once connected, the unit can be controlled from the STICK remote app or programmed using the *Arcolis app for *Apple iOS and *Google Android devices. Easily controls any DMX decoder. The STICK-DE3 is based on 4 modes. 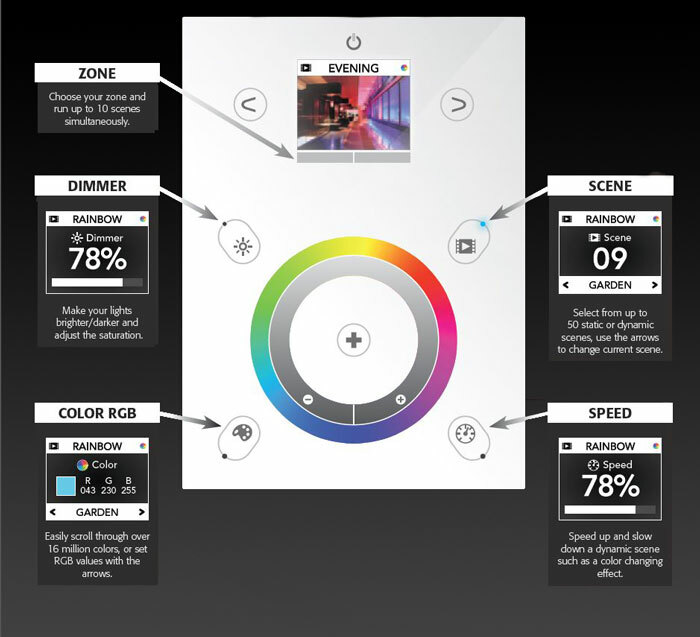 Scroll around the touch sensitive wheel to change the dimmer, color, speed or scene or tap around the wheel for direct access to a value. The arrows can be used to step through values. The STICK-DE3 includes an integrated ethernet controller. This allows the unit to be programmed and controlled over a local network. 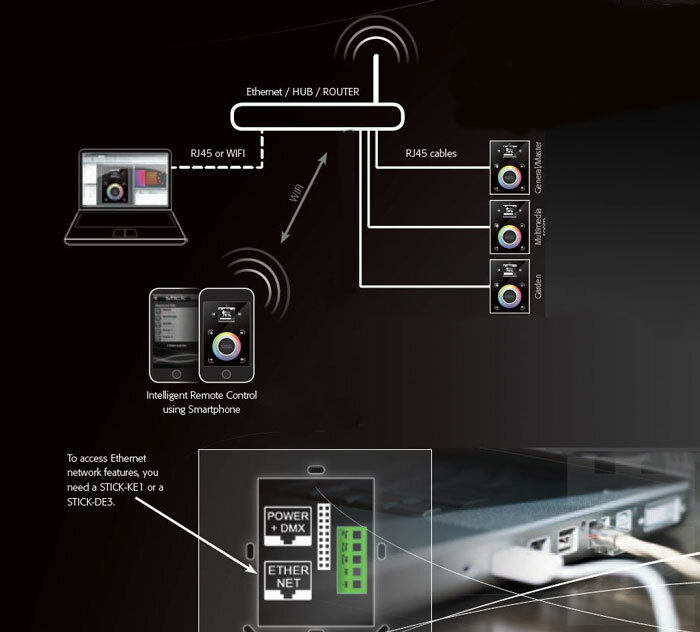 Program the controller over ethernet using any of our computer software packages, or connect with an Apple or Android smartphone or tablet to program with the Arcolis app or control wistyle=”max-width: 100%; height: auto;” th the DMX Lightpad 3 app.